What's New for the 2018 Lincoln MKZ? With the 2018 Lincoln MKZ, you can expect much of the same qualities as previous years. The upscale Lincoln MKZ has some recent updates, including a plusher ride, simplified controls, a more convenient trunk release, and new engines. It is a highly comfortable cruiser, a good value for your money and has high safety ratings. If you are in the market for a midsize vehicle, the luxurious 2018 Lincoln MKZ is a great choice. The 2018 Lincoln MKZ offers the following trims: Select FWD, Hybrid Premiere FWD, Premiere FWD, Hybrid Select FWD, Premiere AWD, Select AWD, Reserve FWD, Hybrid Reserve FWD, Reserve AWD, Black Label FWD, Hybrid Black Label FWD, and Black Label AWD. A fully retractable panoramic glass roof is available for select choices. SYNC 3 is offered in most of the trims. This is a voice activated design with select features. 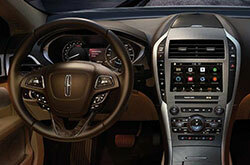 The audio system offered for the new Lincoln MKZ is Revel Audio System. This surround sound technology can turn your car into your own private concert. You will be able to feel and hear your music in a clear and distinct tone. 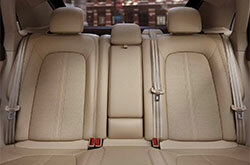 Also available is the Lincoln Enhanced Active Park Assist and Lane Keeping System. Both of these can give you an easier driving experience. With the park assist, getting in and out of tight spaces becomes a breeze. An available Twin-Turbocharged 3.0L engine gives 400 horsepower and an exciting driving experience. Dynamic Torque Vectoring and adaptive suspension will control power, giving an even more exhilarating driving experience. All of the non-hybrid vehicles have the standard turbocharged 2.0-liter four cylinder engine, six-speed automatic transmission, and 245-horsepower. 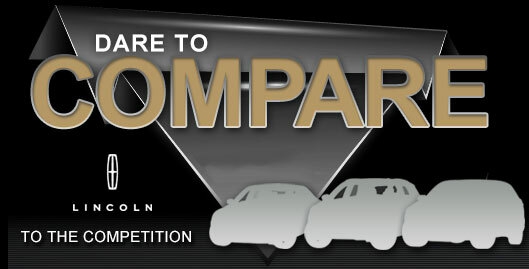 The average fuel economy is 21 mpg for the city, and 31 mpg for the highway. For an upgrade, a V6 twin-turbo engine is available. This engine can crank to about 400 horsepower with all-wheel drive and 350 horsepower for front-wheel drive. A hybrid powertrain is also available. 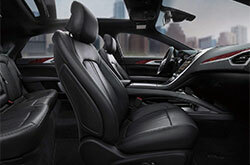 This doesn't cost anything extra and includes a variable automatic transmission and a 2.0-liter four-cylinder engine. 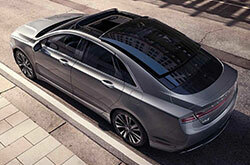 The Lincoln MKZ is considered a front-wheel-drive sedan, but all-wheel drive is available. It is not available for hybrid versions, but it is with a gasoline-only powertrain. Available safety features include the following: driver air bag, passenger air bag, front head air bag, front side air bag, 4-wheel ABS, rear head airbag, brake assist, 4-wheel disc brakes, daytime running lights, electronic stability control, traction control, integrated turn signal mirrors, pretensioners, and child safety locks. Stability control for the 2018 Lincoln MKZ will automatically sense when the vehicles handling limits are exceeded. It will mechanically reduce the power on the engine and apply brakes without losing the vehicles control. Furthermore, the pretensioners will tighten systematically, putting the driver in an optimal seating position for a collision.